Muvee was established in 2001 and has been providing even novice movie makers the chance to create professional films since the day the company opened for business. Muvee's line of software offers anyone the ability to avoid those horrible home movie moments by editing the simplest film to a professional quality. All of those moments that you want to remember can be captured and then turned into your ideal vision. It does not matter if you need the software for home or business, use there is an option available to meet your needs. Muvee Reveal X gives you the ability to make your videos and photos into movies on a number of devices in just three steps with high definition fully supported. The interface is simple and includes professional transitions, effects and music all integrated to give an product. 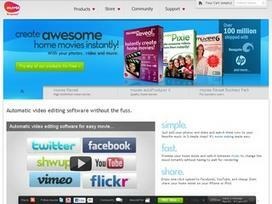 The software allows you to use captions, credits and titles to customize the finished product. It is even possible to animate the text and control the level of clipping that is performed. There are many music options, ensuring that everyone's style is perfectly suited. The business version offers even more, with licensing rights are built into the software program, giving the user the ability to use the films for commercial purposes. Social media functionality, such as YouTube and Facebook integration, is also included. The program allows the user to automatically create video cuts with muvee Reveal Express and upload the movies to your favorite social media site with one click. Professional quality video has never been easier to achieve. Muvee even offers software that allows you to turn your photos into professional quality calendars, prints, photo books and albums. The need to upload images individually is eliminated and the ability to upload multiple photos at once is enabled with the software. Products are created in minutes, and a single button is all that it takes put your fully edited photographs onto your favorite social networking site. An Android application makes it possible to have your photo software with you at all times. The vast line of user-friendly software means that there is no longer any excuse not to have professionally edited media. Special occasions such as weddings, school recitals and family portraits can all be taken care of without the need to hire someone to do the task for you. Professional business presentations to attract more customers are simplified, saving money on large marketing campaigns by giving you the ability to do everything that they would do without assistance. The vast selection of software means that you simply determine your needs and pick the option best suited to them. Professional quality is given with all products, which is how Muvee is a leader in the software industry offering only high-quality products. Share what you think about Muvee, and your favorite ways to save there!